Completed at the dawn of the American Civil War, the historic Edwards County Jail building was built in the Georgian style of architecture, although later changes have taken away some of its Georgian features, such as the size of the windows. 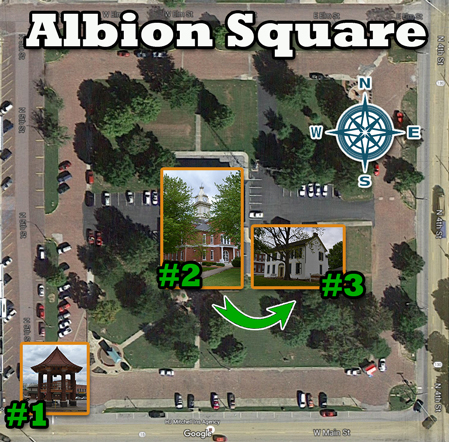 Situated on the public square, it is one of the landmark historic buildings in Albion. workman, charged low prices, and always took pride in doing a good job. The contract specified the design of the building substantially as follows. The material for the walls was to be of brick; the size, forty‐two by twenty‐four feet and two stories high. A hall, eight feet wide, was to extend through the center of the building, both above and below. entrance is identical to the one in the nearby 1842 Dr. Frank B. Thompson home, which has housed the Albion Public Library since 1922. The foundation was to be of blue stone, eighteen inches in the ground, and deeper where necessary, “said foundation to extend one foot above the ground and to be eighteen inches in thickness”. The outside and partition walls were to be thirteen inches thick, being triple brick walls. The brick walls are laid in common bond with sixth course headers; meaning there are five rows of stretchers (which are lengthwise brick), then one row of headers (with the small end of the brick facing out), forming a bond. good sound oak. The locks of the cell and debtors’ rooms were to be sufficiently strong for jail purposes. For the completion of the building, the contractor received $2,600 in four payments, six months apart. Vallean & Jacobs, of Cincinnati, Ohio, were paid $1,000 for the ironwork and plumbing of the cells. On December 19, 1892, the Board of County Commissioners signed a contract with J. M. Weaver, representing the Champion Iron Company of Kenton, Ohio, for the erection of a new jail building and the reconstruction of the old 1859 building into a residence. 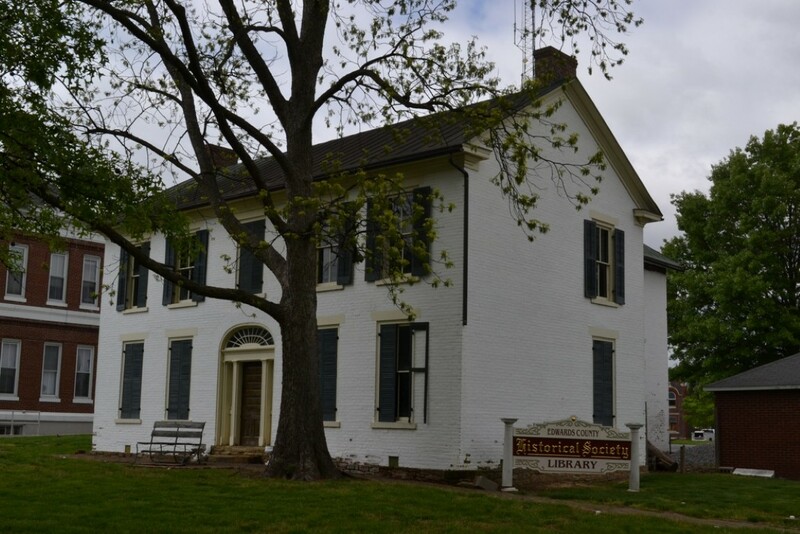 The contract called for a new two‐story brick building, 22 by 24 feet in dimensions, in the rear (or north) of, and attached to, the 1859 building. In the center of the ground room was to be two steel‐clad cells, each seven feet square; and there was also to be a corridor five feet wide and 14 feet long for the use of the prisoners. The old 1859 cells were to be removed to the upper story of the addition where they would be rebuilt for the confinement of additional prisoners when necessary. The locking device of the new cells on the first floor was regarded as the best available at that time. The contract also provided for all sanitary requirements, heat and ventilation. The cells are still in the locations in which they were installed in 1893. The old 1859 building was to be used thereafter as a residence for the jailor and later the sheriff and his family. It was to be “fitted with new windows and doors, and re‐roofed”. Until 1893, the windows of the original 1859 building were shorter, much like those on the nearby Albion Public Library, and were covered with iron bars. The west room downstairs was the “cell room” and the east room was the “debtors’ room”. The building was no longer used as a jail after July 1973, but continued to serve as headquarters for the sheriff’s department for another quarter of a century until the north addition to the courthouse was completed in 1998. Realizing the historical and architectural significance of this Civil War era building, the Edwards County Historical Society undertook its restoration. The standing seam metal roof has been restored and the entire building was tuckpointed and repainted. When the interior is restored, the building will house the historical society’s archives and genealogical library. Directly west of the Courthouse is Entry 3, the Edwards County Jail! 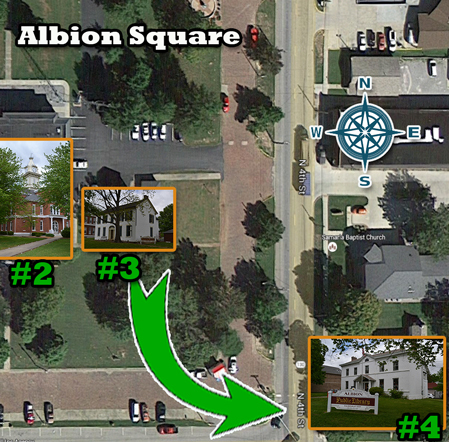 To reach the Albion Public Library from the Edwards County Jail, walk east and cross Fourth Street (a.k.a., Illinois Route 130). The library is located on the northeast corner of Fourth and Main Streets. The best way to get to the library from the courthouse square is to cross Fifth Street, then cross Main Street at the Fifth Street intersection. Follow Main Street east to Fourth Street (Illinois Route 130), use the cross walk, then cross Main Street.